These products should both be in my March empties post but I wanted to single them out for a more in depth review as they're both quite expensive products which should be worth the £££ if you're going to splash out. The problem is though, even after using both of them until they were empty, I am still largely undecided as to whether I actually like them or not. I have never used a product like this before in terms of texture. I bought it from Space NK on a whim to use as a primer (which is what I read it was) but it doesn't feel anything like a traditional under foundation primer. By Terry says....Sweep away imperfections and light up tired skin with the first day and night embellishing care formulation. Teint de Rose reveals a fresh, rosy complexion at the same time as it tones, refreshes and hydrates your skin. Ultra-smoothing and deeply moisturising, use as a base under foundation, or apply before bedtime and wake up to a luminous, radiant glow. The texture is an incredibly light and cooling gel/cream which leaves an almost metallic pink sheen on the skin. I know this sounds scary but the pink tinge is undetectable once you apply foundation over it but you wouldn't be able to wear it out in public without foundation as it is a very obvious pink metallic sheen. It does feel hydrating as well but it doesn't really resurface, smooth or make the skin more even toned. But I am not sure what this is trying to be-is it a make up primer or is it a skincare treatment? I am not sure that it works well as either. And I kind of want it to be one or the other. I don't like confusing skincare! It's £56 from Space NK which is really expensive for a product which isn't amazing. Considering this is actually my second bottle of this elixir I am still on the fence! Kiehls say...The elixir works all night to replenish the skin with moisture and leave younger-looking. skin by morning. Enriched with a blend of naturally derived ingredients including Squalane, Evening Primrose, and a blend of essential oils. This readily absorbed elixir helps the skin to recover radiance by morning, with skin feeling smoother and softer. Enriched with Squalane, Evening Primrose Oil, Omega-6 Fatty Acids and Essential Oils including Lavender, our formula provides a boost of intensive moisture to dehydrated skin. The formula instantly penetrates the skin surface to help replenish it with moisture. Our concentrate is designed to work at night; with skin hydrated, supple and soft, rest assured you can say goodnight to a tired-looking complexion. I love the bottle with the dropper which dispenses the right amount of product. This is a watery serum rather than an oily serum and feels very light on the skin. I pressed the serum into my skin after toning. Undoubtedly it smells amazing and is the perfect fragrance to wind down after a long day. Initially I really enjoyed using this-I felt like it hydrated my skin without overloading it but now and again it felt like it would break me out-it could be the lavender oil which doesn't seem to sit great with my skin sometimes. I think though that you have to watch the shelf life of this product (18months) and because I went back and forth with this product I think mine may have gone off and been over 18 months old. I don't know for sure as I am not an expert but I think as products with essential oils get older and are exposed to air they lose their potency. The blue glass bottle though does help to stop sunlight getting at the oil. I am not sure which Kiehls counter I bought this from but it retails for around £36 for 30ml. Of the two products, although I am undecided this is the one I would consider a repurchase of as I remember loving it initially. 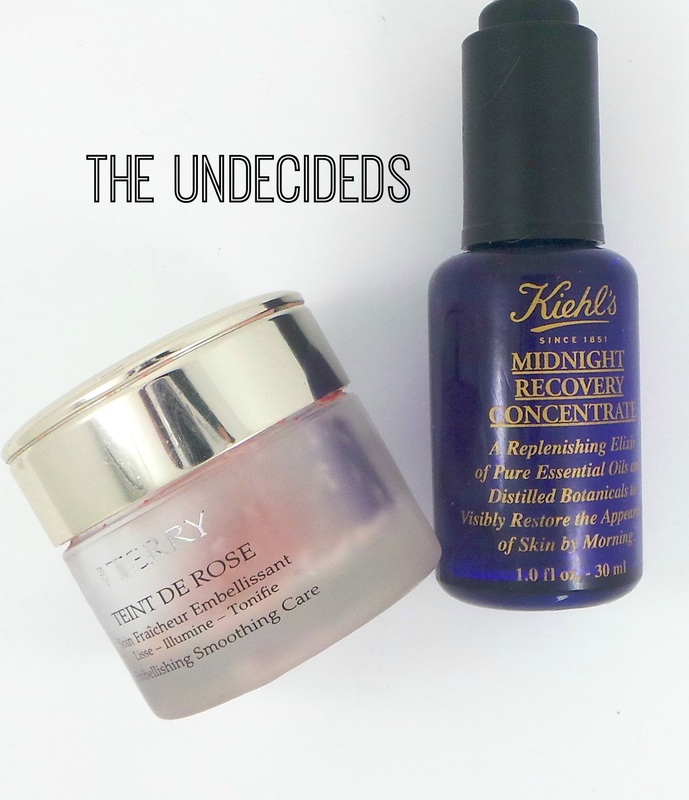 Do you have products you have used up but remain undecided on? I love my purple bottle! Of course I got the small sample size, but may purchase the full size. It does occasionally give me a little tingle when I apply it to my cheek area where my capillaries are damagaed. i'm always on the fence with night serums/oils - i like the nourishing oily texture but then the lighter ones seem less "risky" to apply on a regularly basis... and like you said sometimes i feel like things are off since i leave them unused for months haha typical skincare junkie problem!!! Hmmm quite expensive for something that hasn't made a huge amount of difference, I was considering buying the By Terry Primer, so thanks for the review! My Mum has the Midnight Recovery and hasn't used it yet, (I told her to buy it) I was dying to know what it was like. Ooooops maybe she wont be my friend anymore lol. Hmm usually when I use something up, I really like it. That or for the moment it is the best in the category in my arsenal. If your skin doesn't like lavender oil much, I can see why you have problems with the Kiehl's one. I had a deluxe sample. While I liked it, I never purchased it full-size because I wasn't sure how this much lavender oil (I'm basing this on the smell. It has quite a potent lavender smell) would do to my skin if I use it on a daily basis. I have quite a few such products that I am feel undecided about. The Clarins exfoliating brightening toner comes to my mind immediately. Everyone seems to love it andI like it too but on me it feels a tad bit sticky and takes absolutely ages to show any results. I too have quite a few products I am undecided about. I like this Kiehl's Serum and I find when I use I wake up to plump fresh looking skin, but I am a little older than you and so this might work a little differently on you. What's in my handbag-the weekend edit.